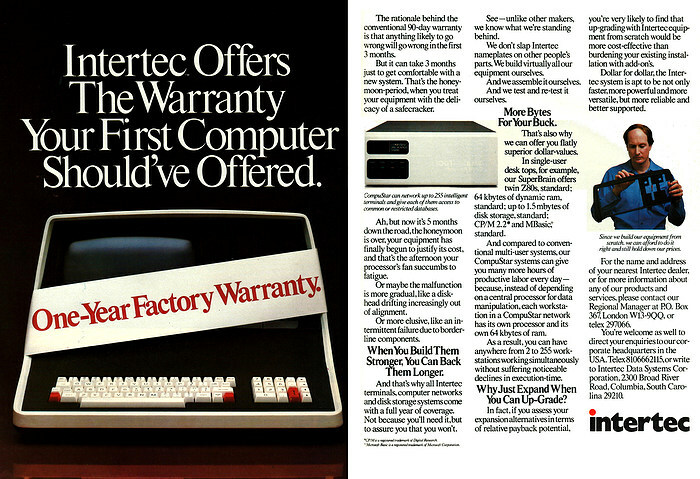 This advert appears to be about the only one that Intertec ever did that actually features its SuperBrain micro, which was fairly omnipresent for a large chunk of the early 1980s, and majors more on Intertec's longer warranty periods than other manufacturers of the day. The SuperBrain was a twin-Z80 machine with 64K dynamic memory and up to 1.5MB floppy-based storage, running CP/M. When the first adverts started appearing for the SuperBrain, some in the press thought that the machine seemed too good to be true. The machine then suffered the usual delays in actually getting to market, which appeared to spawn rumours of trouble. When it did finaly appear, Sue Eisenbach's review in August 1980's Personal Computer World was very favourable, calling it a "compact, attractive 'single box' computer. It's competitively priced [and] has some lovely touches. I found the SuperBrain completely reliable, a pleasure to use and very impressive with the new, quiet, double-density double-sided drives". Clearly though, Intertec - based in Columbia, South Carolina, US - couldn't be arsed that much with internationalisation of their advertising, mentioning "dollar for dollar", "dollar value" and "labor" in an advert which appeared in the UK's Personal Computer World. It did, however, manage to survive through until the late 1980s, where it became known as Wells American, selling its CompuStar range of IBM compatibles.